Have vaccines come into our society and rescued us from the “evil” viruses and bacteria, without any consequences? Could it be true that an injectable biological product–filled with viral and bacterial antigens, aluminum, formaldehyde, human fetal cells, monkey kidney cells, antibiotics, preservatives, food proteins, monosodium glutamate, polysorbates, and any number of potential viral, bacterial, and material contaminants–given in conjunction with up to four other vaccines into the different limbs of a brand new baby (who hasn’t even had food yet because his gut is too immature)–is really one of the greatest gifts to civilization? Instead of the greatest achievement in public health, it might be the greatest lie ever told. Because after more than a century of vaccines in regular use, instead of seeing our infant mortality drop, and the health of our children improve, with more and more vaccines added to the schedule and higher vaccination compliance, we see the exact opposite effect. Our kids are sicker. Our adults are sicker. Are we all asleep? Do Paul Offit and Richard Pan even read the news? Too many people in positions of power are either on autopilot, metaphorically asleep, or literally asleep to the real dangers of vaccines–kind of like the sleeping Assemblyman who voted for the passage of the New Jersey vaccination bill to tighten religious exemptions. They are going to continue mandating these vaccines. They are going to keep passing laws that make it harder and harder to get exemptions. And they also want to take away your right to free speech so you can’t criticize vaccines or talk about vaccine injuries. The United States has a similar neonatal mortality rate to other comparable European countries, but has a higher postneonatal (1-12 months) mortality rate. Don’t fall for the argument that we just count more premature infant deaths than other countries because that’s not true. The neonatal rate is comparable. In the developed world, infant mortality rates are highest in countries who have more vaccine doses, like the United States, and is lower in countries whose infants are vaccinated less, like Japan and Sweden. The leading cause of postneonatal death is Sudden Unexplained Infant Death (SUID), which combines deaths from SIDS, Unknown, and Accidental Suffocation and Strangulation in Bed. The majority of these deaths are directly caused by vaccines. In 1994, the “Back to Sleep” campaign recommended that parents place their infants to sleep on their backs, and they estimated a 50% reduction in SIDS diagnoses as a result of the campaign. However, diagnostic transfer to other causes of death occurred (like ASSB and Unknown) so since 1998 total SUIDS deaths have stayed the same despite more babies placed on their backs to sleep, more women breastfeeding, fewer mothers smoking, and more infants receiving vaccinations. There is no true account of how many deaths were actually prevented due to avoiding prone (belly) position. But if supine sleeping position saves lives, and vaccines save lives, why don’t we see the expected drop in the IMR after 1994? Let That Sink In, Where’s the Drop? What we see increasing is alarming. From 2007 to 2015, infants deaths due to encephalopathy (ICD-10 G93.40) increased 129% according to the CDC vital statistics (CDC WONDER). That’s deaths, not incidence. Who knows how many infants have encephalopathy and survive? Encephalopathy is any diffuse disease of the brain that alters brain function or structure. It may be caused by an infectious agent (bacteria, virus, or prion), metabolic or mitochondrial dysfunction, brain tumor or increased pressure in the skull, prolonged exposure to toxic elements (including solvents, drugs, radiation, paints, industrial chemicals, and certain metals), chronic progressive trauma, poor nutrition, or lack of oxygen or blood flow to the brain. A vaccine can cause this. It has pieces of viruses and/or bacteria in them. The parts our bodies recognize. Vaccines have solvents, drugs, chemicals, and metals in them. Why wouldn’t we even consider this? Should We Even Mess With Nature? It’s kind of like how antibiotics came in and saved the day, rescued us without any backlash, never destroyed our guts and never evolved into MRSA (Methicillin-resistant Staphylococcus aureus)? RRrrright? Seriously, when in the history of medical science has there ever been an absolutely safe prophylactic medical intervention or procedure? Heck, even a bandaid has risk. We created superbugs. While antibiotics enjoyed similar medical worship as vaccines for decades, an unintended consequence of their abundant use was that we created antibiotic resistant strains of bacteria, known as superbugs like MRSA. We artificially selected for bacteria that are methicillin resistant (by killing bacteria that agreed to die), and these new bacteria can’t be killed by antibiotics at all. It was a big human mistake, and now all we can do is stop over prescribing antibiotics and hope new scientists can adapt to the adaptation of this superbug. We also destroyed our guts. Who knew that not all bacteria were bad?! It turns out a balance of bacteria is the ultimate picture of health. Antibiotics disrupt the balance, causing asymptomatic, normally occurring populations of bacteria like C. difficile to become pathogenic. Now we buy bacteria in the form of probiotics, and eat fermented foods to replenish and repopulate our microbiomes. Since the majority of our immune system cells live in our guts, that’s probably a good idea. But a hundred years ago, we didn’t know this. Early penicillin use also contributed to an assortment of allergies, not just to the antibiotic, but also to peanuts, according to Heather Fraser. In nature, a balance is what creates harmony. When you remove something from an ecosystem, the ecosystem fails. We wouldn’t be who we are without viruses, and we won’t evolve, without viruses. This study found that 30 percent of all protein adaptations since humans’ divergence with chimpanzees were driven by viruses. That includes both immune and non-immune functions. Retroviruses are the reason we are able to make the human placenta. A particular protein encoded by one particular virus, HERV-W, known as syncytin appears to be imperative for proper formation of the placenta. Without it, pregnancy complications may occur, including pre-eclampsia. A bacteriophage is a virus that only targets bacteria and lives in human cells. This is called a symbiotic relationship and it exists all throughout nature. One bacteriophage, called CrAssphage, is the most abundant human-associated virus known, comprising up to 90% of sequences in the gut virome. It targets one of the most common bacteria in the gut, Bacteroides. They are an important part of a healthy gut. When mice were bred in sterile environments, free of viruses and bacteria, their immune systems developed abnormally: they didn’t make enough of certain T cells, which are vital for immune function, and they made too many of other immune cells implicated in allergic reactions. They also developed abnormally thin villi, the microscopic fingerlike projections on the gut wall that help absorb nutrients. When the mice were exposed to a bacteria, or a norovirus, their immune cells rebalanced and their villi fattened. Another virus known as the γ-herpesviruses can help to prevent mice from infections due to Listeria monocytogenes and the cause of the plague, Yersinia pestis. Latent herpesviruses arm natural killer cells, an important important white blood cell in the immune system, which kill both mammalian tumor cells, and cells that are infected with pathogenic viruses. Not all viruses we deal with today are human viruses. The virus we know today as respiratory syncytial virus (RSV), was actually first identified in 1956 as a chimpanzee coryza agent. It was recovered from a medical laboratory chimpanzee with a cold that had infected the entire colony and its handler. In the 1940s and 1950s chimpanzees were used in the making of the polio vaccine. Chimpanzees were used to attenuate the polio virus, but other viruses and bacteria may have contaminated the end product and introduced simian viruses into the world’s vaccinated population. After that we see both RSV and HIV, both simian viruses become a cause of infections in humans, which before that time was not happening. Is cancer an effect of mass vaccination programs? This study found a lower cancer risk for patients with a history of febrile infectious childhood diseases (FICD). The strongest associations were found between patients with non-breast cancers and rubella and chickenpox. A strong association was also found with the overall number of FICD both ‘classical’ (measles, mumps, rubella, pertussis, scarlet-fever and chickenpox) and “other”. For many decades now, measles virus has been investigated as a cancer therapy. A number of viruses including adenovirus, reovirus, measles, herpes simplex, Newcastle disease virus and vaccinia have now been clinically tested as oncolytic agents, meaning a virus that preferentially infects and kills cancer cells. So when we remove more and more viruses, what do you think happens to humans? Has anyone asked this question? On a small scale, we can see that each vaccine does have a direct consequence on particular strains not covered by the vaccine. For example, after the introduction of the varicella vaccine (chicken pox) we see an increase in cases of shingles, including pediatric shingles. The HPV strains not targeted by the Gardasil vaccine are now increasing in incidence. I love that they say vaccines are safe. They say aluminum is safe, because it’s excreted. They also say GMOs are safe. They say glyphosate is safe. They say the chemtrails that grid the sky are just water evaporation. They say tylenol and ibuprofen is fine in moderation. They say high fructose corn syrup is fine, and sugar is fine. They say fluoride is good for you, and folic acid is no different than methylfolate. They say amalgam fillings are no biggie. They say ultrasounds are safe, and cesarean sections are no different than vaginal, and epidurals, and the vitamin K shot and the rhogam shot are perfectly safe. They say artificial infant formula is safe. If everything is SAFE what in our environment is causing the increase in disease, allergy, and neurodegenerative disorders? There’s nothing left! Do they not know how ridiculous this looks? Vaccines traded a short lived infection that may have lasting benefits and protection for chronic disease, cancer and/or death–they didn’t and aren’t making us healthier. Something in our “environment” is causing SIDS, cancer, autism, epilepsy, diabetes, asthma, food allergies, etc. Every scientific article addressing any of these subjects declares that genetics is not solely responsible, that it is a combination of environment, specifically chemicals, and genetics (I translate this as MTHFR because at least 30% of the population is estimated to have at least one MTHFR mutation). Bottom line, the mortality rate for these diseases was already extremely low before each respective vaccine was ever in use. 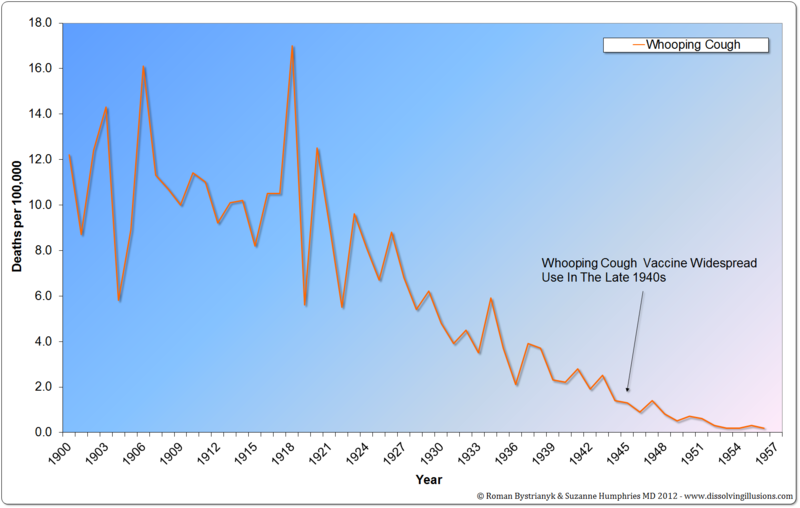 Mortality improved dramatically after the turn of the century for many reasons, but vaccines aren’t one of them. I don’t think we need to fear viruses. But we should fear living without them.